K2 is the second-highest mountain on Earth as well as the second deadliest. It’s known as the Savage Mountain, as it kills one person for every four who have reached the summit… And K2 has never been climbed in winter. Now your team stands in its shadow, ready to climb for fame and glory! You know the dangers of K2 all too well. Extreme weather with frequent and deadly storms, exposed, steep, tricky routes and lack of oxygen await you on your way to the summit. You will test your climbing skills to death, try to outsmart the ever-changing weather and always worry about the acclimatization of your 2 mountaineers. Also there are the other teams ready to take the glory for themselves. I have played this game a number of times now: once with 4, a few times with 3 players, and the other times with 2 players. This game’s execution is far better than I originally assumed it would be. Let me explain: I thought it would be hard to create a good climbing game and assumed this would feel more like Chutes And Ladders or Sorry than a true strategy game. However, I have found that it is well balanced; it is simple with a lot of subtle, nuanced strategy; and it is just plain fun. To know what I am talking about, you may need to go familiarize yourself with the rules. This post will probably be long enough without trying to give context with rules explanation. Well balanced: The board. I have only played the easy side of the mountain, but it is incredible how well the mountain gets harder as you scale the mountain both in terms of the movement required and the acclimatization required. It does not feel impossible to make the top and survive with both climbers, but you soon find out that you have to be extremely careful. You push too hard and get caught in bad weather, your acclimatization can go down by 4 in an instant, and given the max possible acclimatization is 6, you can find yourself in trouble fast. So, especially at the top where bad weather is more common, you’d better have some large acclimatization cards to play on your next turn because otherwise your climber will die. On the other hand, if you plan your assent carefully and move a little slower, you can be pretty certain that your climber will survive. Getting both climbers to survive? For that you will probably find that you never get both climbers to the top if you want both to survive. Of course, there is a bit of luck to this game too. You can get bad cards and have things go south on you. In a way, that only makes the experience more real, though; more true to the risk a K2 climber really takes. Not only could that happen in real life, but the game’s player card system (of drawing cards and choosing what you want to do) allows you to mitigate that randomness most of the time. The cards also are well balanced. For example, there is a good distribution of 1-3 movement cards to give you interesting, different options. You have the ability to sometimes scale the mountain quickly, but if you do that, you will be forced to move much slower in subsequent turns (because you simply won’t have the cards to move fast). Of course, you can also achieve a balance, moving neither fast nor slow. Strategy: When you go up the mountain the first time or two, you might not think there is much more to the game than the race. However, you will eventually notice how clogged the top of the mountain gets and how a player can potentially block climbers ascending or descending. Then you start to get devious. The other player got his climber to the top of the mountain first? Ok. Pitch a tent below him and camp there. You might just trap him/her on the top of the snowy, freezing mountain and kill the climber, reducing the victory points from 10 to 1. Devious and, excuse the pun, cold-blooded. Also, each player has 2 climbers, which works way better than I expected. I thought this would make the game cumbersome, but found that having 2 climbers only enhances the strategy: now you have to decide whether to move your climbers together and/or when to break them up so one can make a rapid charge toward the mountain top. 2 climbers also gives you a better chance to block other players too, as previously described, if you can do it and keep both of your climbers alive. Fun: The game is easy to teach and pick up as the rules are light. They are simple yet effective. Moreover, a game goes pretty fast once everyone knows the rules. You could easily complete a game within 30 minutes if everyone stays focused. Finally, with the games subtle strategies, I found myself congratulating opponents on clever moves or cursing myself for getting careless. That meant I felt like I was learning. I wouldn’t do that again, or now I know what I would do to my opponent in that circumstance next time. End result: I wanted to play again and again to not only even the score but, more importantly, see if I could pull of those new strategies I contemplated. 2) It is simple enough that if you played it a lot, I think you could burn out on it fast. It is replayable, but it works best for me when I bring it out every few game nights instead of playing it a lot. The simplicity is nice for new players but could reduce replay value if you game often. 3) The theme turns some people off. I love the theme but some friends haven’t wanted to play it simply because they were not interested in climbing or in a climbing game. Nevertheless, I still highly recommend this game. Get to the top and enjoy the tense moments it brings. K2 was designed by a mountain climbing enthusiast and it shows. The game is excellent at providing a feeling of trepidation as you reach the top of the mountain (in a good way). The goal is simple. Get your two climbers to the top of K2 before the other climbers and you win. Sounds easy, right? Wrong! You’re constantly battling the elements. Every turn you need to decide how balance progress with safety. Simple enough, but then you get towards the top of the mountain and you find that your opponents are blocking your way up, or worse, your way down. Then there is the weather to contend with. This is where the game really shines (pun somewhat intended). You can choose to play the summer weather deck (easy), or the winter weather deck (hard). Each day’s weather will pose different challenges either on your movement, or your safety. This becomes particularly difficult the higher you climb. This game features two play boards, a summer board (easy) and a winter board (hard). This allows four possible difficult combinations: Summer board & weather, Summer board & winter weather, winter board & summer weather and winter board with winter weather. Pros: The game represents its theme well and has lots of difficulty options for casual and serious gamers alike. Cons: It’s a thematically serious game. It may not hold the interest of pre-teens very well. 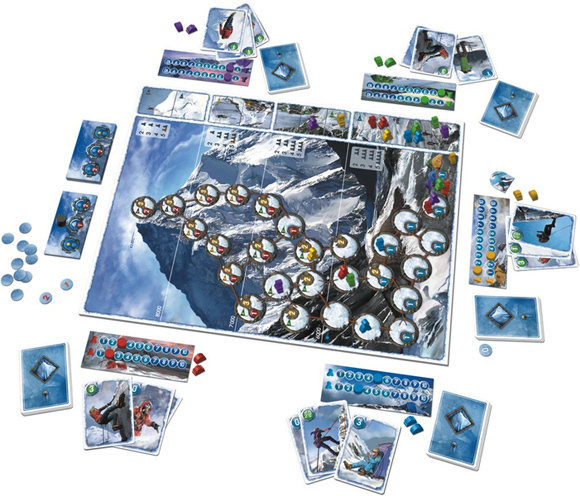 If you like mountain, climbing and boardgames, K2 is your game. The theme of this title is very present and the difficulties and problems that climbers have to face are well represented. I played this game about dozen times and I found that the mechanics well reproduce the dangers of the mountain. If you understimate the situations the mountain will not forgive… and your climbers probably will die. So it is important to manage carefully own hand of cards. The rules are simple to learn and the components are good. Add a Review for "K2"